On 1st January 1957 a meeting between representatives of the local amateur operatic and dramatic societies was convened by Southend-on-Sea Borough Council’s Entertainments Committee, at which they were invited to form a “supporters’ club” for the Palace theatre. Those societies had a vested interest, as the charter which presented the theatre to the people of the borough in 1942 contained a clause allowing the amateurs to put on their own shows. It was, therefore, in their own interests that the theatre remained viable. 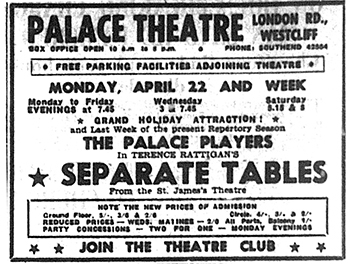 It was duly agreed that the Palace Theatre Club would be formed, and its first Committee would be headed by Alderman J. E. Longman (President), Ewart Crown (Chairman), Sydney F. Armstrong (Secretary) and Mr J. C. Walton (Treasurer) [the full Committee is listed in Presidents and Committee]. Donald B. Edwards, Director of Productions for the Borough Council, and William T. Tate, Palace theatre manager, were appointed as ex-officio members. A constitution was subsequently agreed, and the Club was allowed the use of a room at the theatre. Club members received concessionary admission on Mondays and Tuesdays. Subscriptions were 5s [25p] for adults and 2s/6d [12½p] for under 18s. The council was to allocate £2,000 for the construction of a club room on the council-owned land to the west of the theatre. Although this never went ahead (it is possible that the money was instead used to build the first floor extension above the covered walkway on the western side) that land was eventually used for the construction of the extended foyer/bar and the Dixon Studio. From the outset, the Council made it clear that, despite its role in its formation, it expected the Club to be self-supporting, and to organise and fund itself. 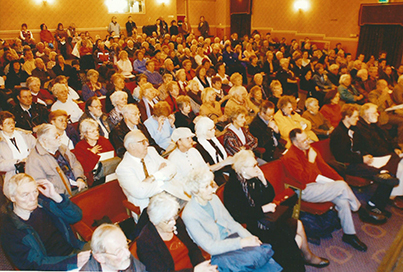 To this day, the Club remains independent of the Council and the theatre’s managing company. April 1957: An exhortation to ‘Join the Theatre Club’! Its first President was Alderman Teddy Longman, a keen theatregoer and mayor of Southend from 1952 to 1953. He was a jovial character, and once caused a stir by making a saucy remark over the loudspeakers during Carnival Week. The remark was addressed to a group of Miss Lovelies standing in a rather shallow bathing pool: “Does the water come up to your expectations?” he asked. He said afterwards that “everyone laughed except the vicar, who came up to me and insisted everyone had been shocked”. Details about the Club were initially circulated to patrons during the remaining run of the Christmas pantomime, Humpty Dumpty, and membership soon reached 300. The Club’s inaugural meeting was held on 3rd March. Mr Crown outlined its objectives and announced that its aim would be “to encourage interest in all aspects of living theatre and, in particular, the Palace Theatre”. By 3rd April, membership had reached 500. Shortly afterwards the first ‘star’ speaker at a Club meeting was Leigh’s own first lady of the theatre, Peggy Mount. In August 1957 honorary membership of the Club was accepted by entertainer/comedian Tommy Trinder, jazz musician Johnny Dankworth and actress Marjorie Westbury, best known for portraying detective Paul Temple’s wife in the popular radio series. Among the founder members was Stella Saunders, who was 18 when the Palace opened in 1912 and had been a first-nighter most of her life. She later became President of the Club and gave her name to the Stella Awards, that were presented annually for outstanding performances in in-house productions. She lived to be 100 years old and remained a strong supporter of the Palace, attending most productions. The ‘Stellas’ were presented from 1982 to 2002, when in-house productions ceased. They were resurrected in 2004 under a new format as the Palace Theatre Club’s Amateur Awards, recognising the best amateur production each year. In 1966, according to the AGM minutes, members paid £15 for a dedicated seat in the newly created Churchill Gardens, in Victoria Avenue. Not too surprisingly, that seat is now nowhere to be seen. Does anyone know what happened to it? 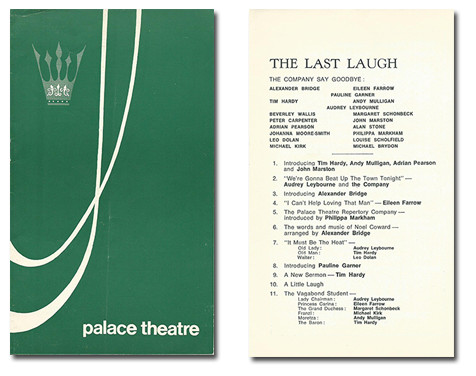 In June 1969 crisis came to the Palace when financial problems mounted and Alexander Bridge’s Haymarket Stage Productions, the in-house company at the time, announced their final show, The Last Laugh. 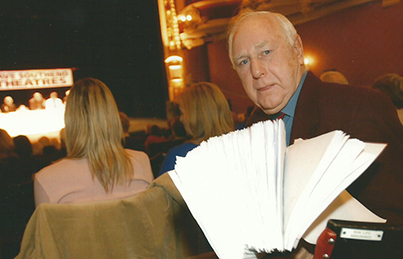 The theatre closed, but the Club swung into action and over 2,000 signatures were obtained on a petition which was presented to the Council, together with 1,400 letters in support of the Club’s campaign. A march through the streets was held with traffic halted in Hamlet Court Road as the protesters, led by Cllr Beryl Scholfield, later to become Mayor of Southend, made their way from the Queen’s Hotel to the Palace. Following these very public displays of support, the Palace reopened in September 1969. In 1970, Southend Borough Council set up the charitable Palace Theatre Trust to manage, and secure funding for, the Palace Theatre. 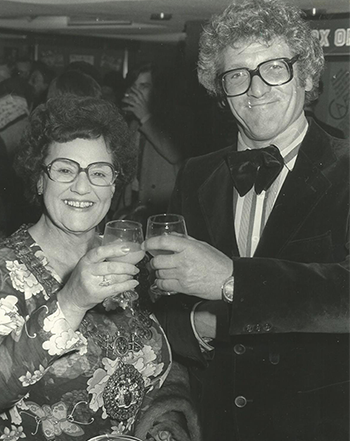 In 1980, when it was decided that there was a need to extend the theatre the Club rallied round and assisted the Appeal Committee by providing £5,500 towards the cost of the new bar. The newly named Palace Theatre Centre opened in May 1982: the Palace’s 70th year and the Club’s 25th. The Club marked the occasion by mounting an exhibition in Southend Central Library tracing its 25 years of support for the Palace. It also commissioned the baking of a massive cake with a picture of the theatre. After being photographed for the local press, it was cut into 400 pieces! 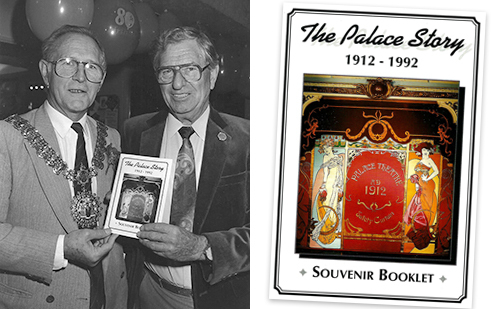 In October 1992, to celebrate the Palace’s 80th birthday, the Club published a booklet prepared by member Ron Montague about the history of the theatre. This was sold to raise money for the Palace. 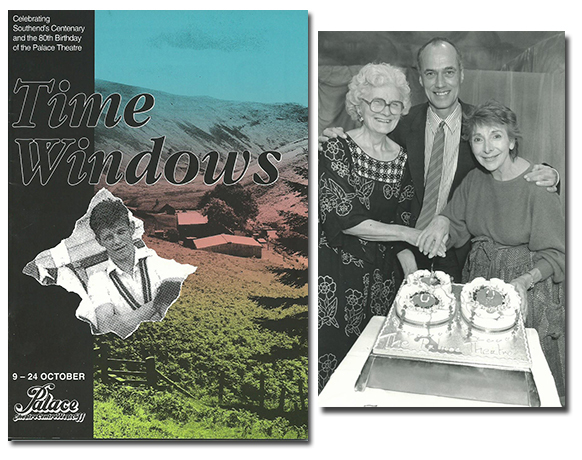 A play, Time Windows, especially commissioned from local writer Michael Wilcox, was sponsored by the Club and presented at the Palace from Friday 9th October to Saturday 24th October. The incidental music for the production was provided by Barrington Pheloung, a local composer best known for providing the music for TV’s Inspector Morse. On Wednesday 21st October BBC Essex Radio’s John Hayes presented his morning programme from the foyer at the Palace, with the public being encouraged to come along and see him and his team in action. In the evening there was a pre-show reception, and after the performance the celebrations culminated in the cutting of a birthday cake. 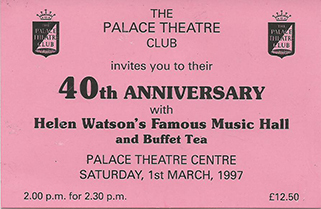 On Saturday 1st March 1997, to celebrate the Club’s 40th anniversary, 200 members enjoyed a special matinee performance of Helen Watson’s Famous Music Hall, followed by a buffet and cake-cutting ceremony. By the late 1990s further financial problems had arisen and the theatre was once again facing closure. 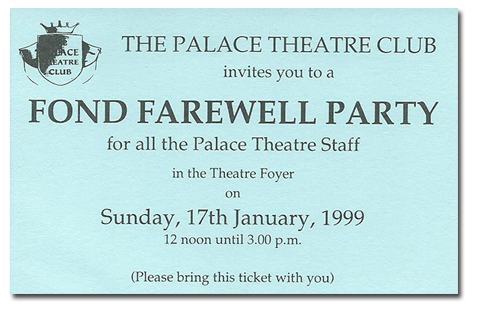 On 17th January 1999 the Club gave the staff and actors who had appeared at the Palace over the past 24 years, during artistic director Christopher Dunham’s tenure in office, a Fond Farewell Party. Seventy-four actors and actresses attended plus staff and Club members. Subsequently, Chris and all 40 members of staff were made redundant and the theatre closed in March 1999 – only to re-open nine months later under new managers Green & Lenagan and with Roy Marsden, TV’s Inspector Dalgleish in the PD James mysteries, as artistic director. But this was to be short-lived as Green & Lenagan pulled out in 2002, and the Palace closed again. This proved to be the end for in-house productions. When the Palace re-opened, in 2003, it was managed by Charles Mumford, in tandem with the Cliffs Pavilion, on behalf of Southend Council, and became a receiving house, taking in plays and other performers rather than generating its own productions. Despite this reorganisation, history repeated itself when yet another financial crisis led to the closure of the Palace in October 2005. Yet again the Club rose to the challenge. Letters were written, a public meeting was held, protest marches took place, council meetings were attended and a petition was handed in with over 22,000 signatures. This demonstrated the enormous strength of feeling about the Palace in the town which the Club is privileged to support and represent. 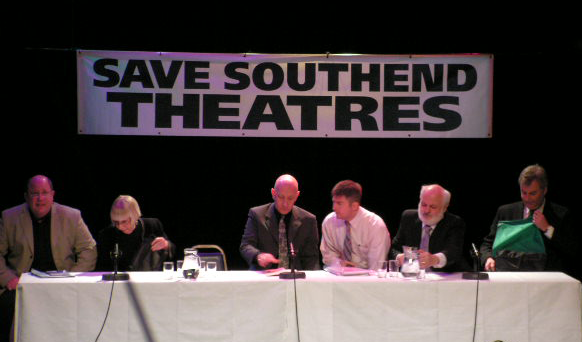 The main protest meeting had been held at the Palace Theatre on Saturday 19th February 2005, when over 300 supporters packed into the main auditorium. The main outcome was the formation of the Palace Theatre Guild, a registered charity and not-for-profit company which staged theatrical events in support of the Palace Theatre. Dame Helen Mirren kindly agreed to become Patron. The acclaimed actress demonstrated the strength of her support by visiting the theatre on 4th November 2006. By this time it had been announced that HQ Theatres would be reopening the theatre. Naturally, the Club was delighted. The Palace reopened in December 2006 and has gone from strength to strength. The Palace Theatre Guild was eventually dissolved in 2013, its aims having been accomplished. The Club reaches 50 years old! The Club celebrated its 50th birthday in October 2007 with a special show in the main auditorium, England’s Pride. This medley of popular wartime and big band songs, presented by singing duo Saul Watts and Pollie Hall, was followed by a buffet in the theatre foyer. In 2012, the Club assisted HQ Theatres in successfully applying for £50,000 from the Heritage Lottery Fund to celebrate the theatre’s Centenary, and was heavily involved in all the events throughout that momentous year. As a lasting legacy, in early 2013 the Club contributed towards a major refurbishment, which saw new seats and carpets in the stalls, repairs to damaged seats in the circle and a much-needed redecoration of the dressing rooms and backstage areas. In 2016, the Club contributed £15,000 to a much-needed refurbishment of the toilets throughout the building. Not only did this help make patrons more comfortable, it also closed a long-standing item under ‘Any Other Business’ at the Club AGMs! On Saturday 2nd December 2017, at its monthly social morning, the Club celebrated its 60th anniversary in style. 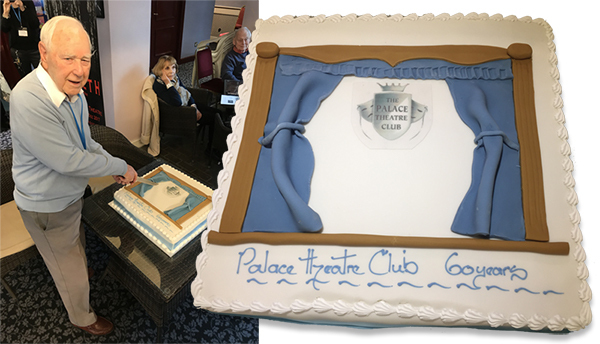 Archivist David Simpson gave an illustrated presentation on the history of the theatre, after which Club chairman Peter Warden cut a celebratory cake. This was much enjoyed by members, who also raised a glass of wine to the next 60 years – and beyond!